Palm Treo Pro and BlackBerry Pearl Flip head to Bell | BlackBerry Blast! It looks like Bell Canada is set to launch a couple of phones. 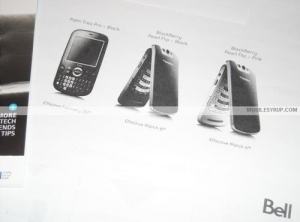 The Palm Treo Pro will launch along side the BlackBerry Flip according to this pic. The BlackBerry Pearl Flip will launch in black and pink on March 6, 2009. No word on pricing for the BlackBerry yet.